Yellow Chartreuse is a 40% liqueur which contains 130 herbal extracts (like a more complex version of Jägermeister?). The 55% variety, Green Chartreuse, is used in the classic cocktail The Last Word. I mixed up two cocktail recipes from The Passenger which utilize Chartreuse – “Monk’s Mule” and “Walk of Shame-Rock” – using Yellow Chartreuse. 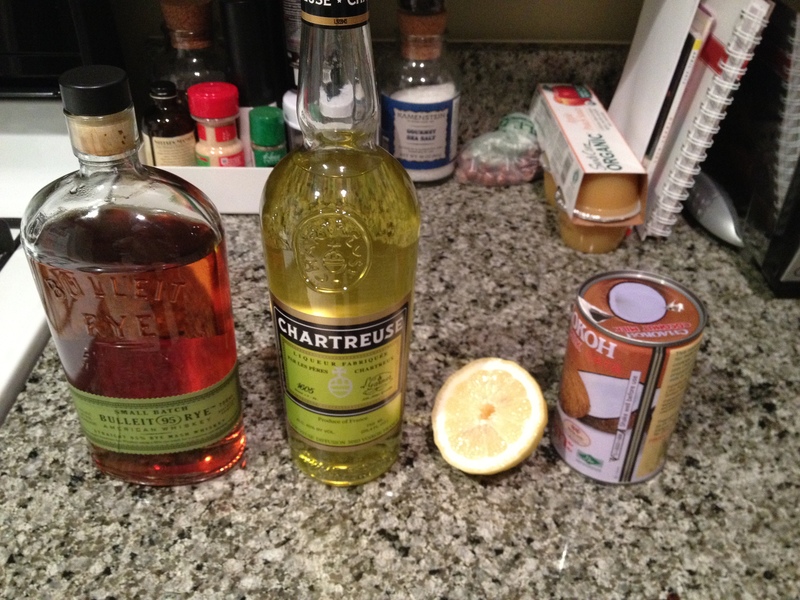 I changed out the Green Chartreuse in the recipe with the yellow variety. Since I didn’t know the proportions involved, I went with 1 oz Hendrick’s gin, 1 oz Yellow Chartreuse, and juice from 1/2 a lime. Shook these ingredients together, strained into a rocks glass over ice, then topped it off with Fever-Tree ginger beer. 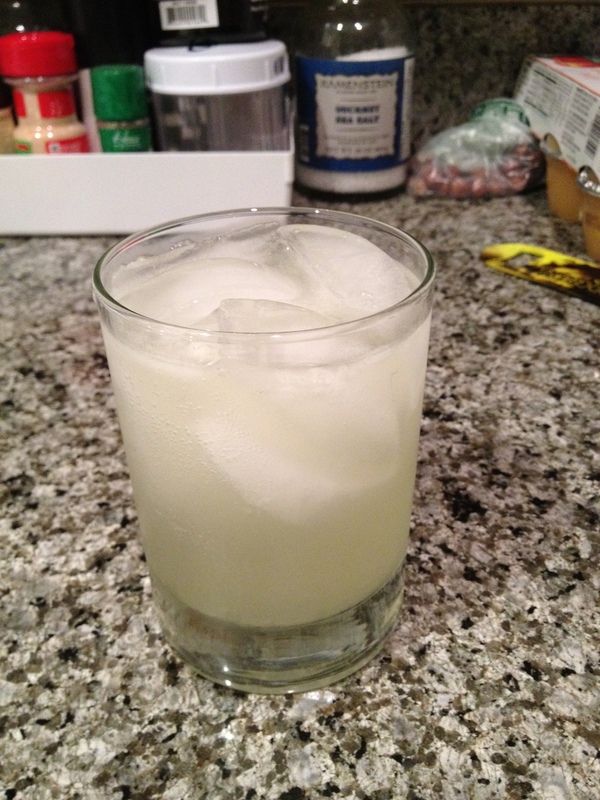 This came out as a nice, light cocktail…good with these steamy DC evenings. Next up was a variation on the Walk of Shame-Rock. 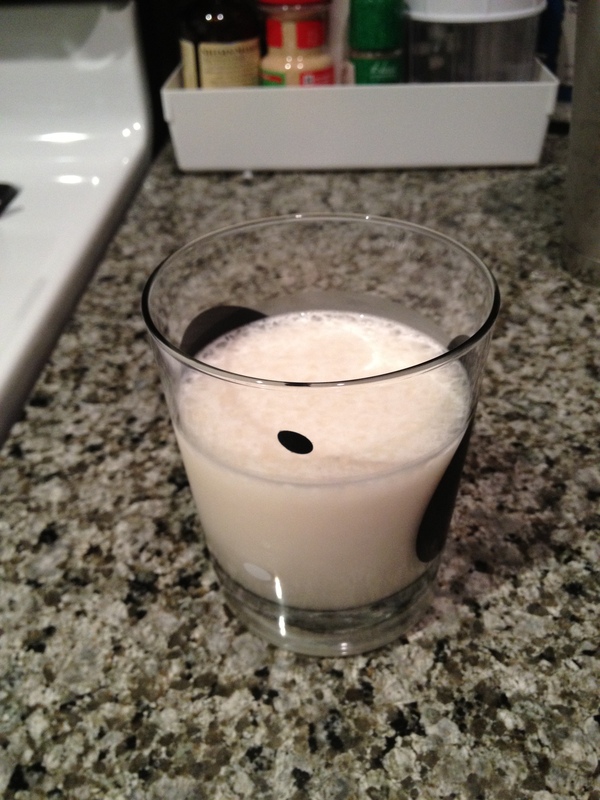 I changed out Jim Beam for Bulleit, swapped in the Yellow Chartreuse, and used coconut milk instead of cream. 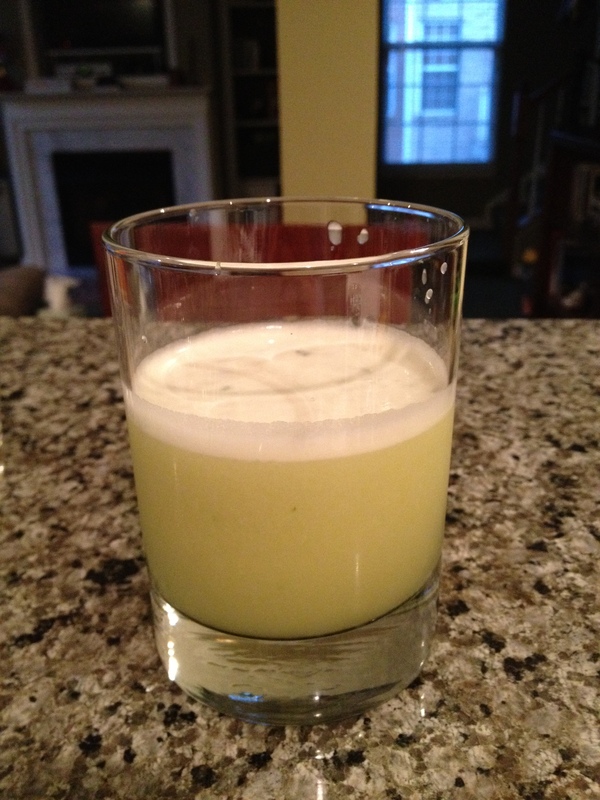 1 oz of the rye, Chartreuse, and coconut milk, and the juice from 1/2 a lemon, all shaken with ice. Tangy and different. I’ll try the original at a later point to compare/contrast. The switch from Green to Yellow Chartreuse makes these drinks a little more sweet and less spicy than they would otherwise be (yellow has honey added, has citrus notes, and other accents, while the green is more floral/herbal). I’ll try making these drinks again with the green variety after I pick up a bottle. 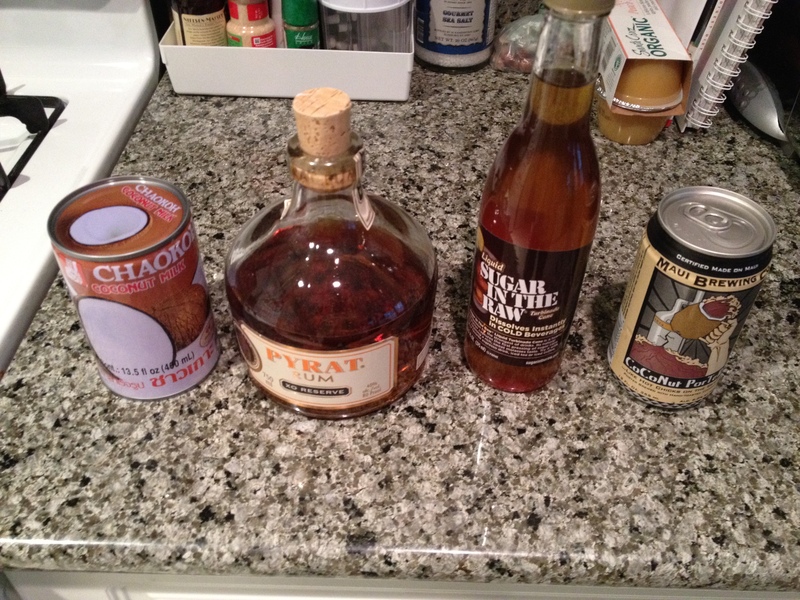 Tonight I put together a couple of beer cocktails from recipes I’ve obtained. The first of these was a version of Black-White & Tiki, which I got hold of at a LivingSocial 918 F Street mixology course put on by Gina Chersevani (formerly of PS 7’s and now with Hank’s Oyster Bar, DC). Combine the rum, coconut milk, and sugarcane syrup, shake with ice until frothy. Pour over crushed ice into a collins glass and top with the CoCoNut Porter. Garnish with a pinch of cinnamon and serve with a straw. I used Sugar in the Raw syrup and Pyrat rum for this rendition. The cocktail comes out nice and chocolatey thanks to the beer…it’s like a beery mudslide, and quite tasty. Next up was a drink I had at Mie & Yu in Georgetown called the “Gaarden of Babylon”. 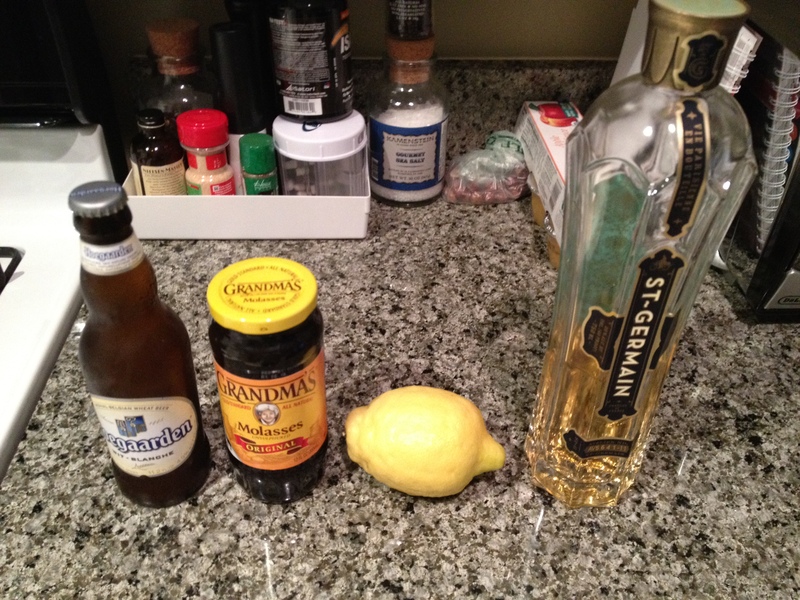 The name comes from the use of Hoegaarden in the recipe. I wasn’t sure of the measurements for each of the ingredients, so I went with 1 oz St. Germain, 3/4 oz molasses (replacing blackstrap syrup), and juice from 1/2 a lemon. Shook those ingredients vigorously with ice – especially important with molasses as it takes a bit for it to mix in. Top off with the Hoegaarden. Comes out as a nice, tangy beer cocktail. If anyone is tracking on a beer cocktail that utilizes Duchesse de Bourgogne, let me know. The Sour Hass cocktail is based on the recipe from Las Canteras Peruvian restaurant in Adams Morgan. 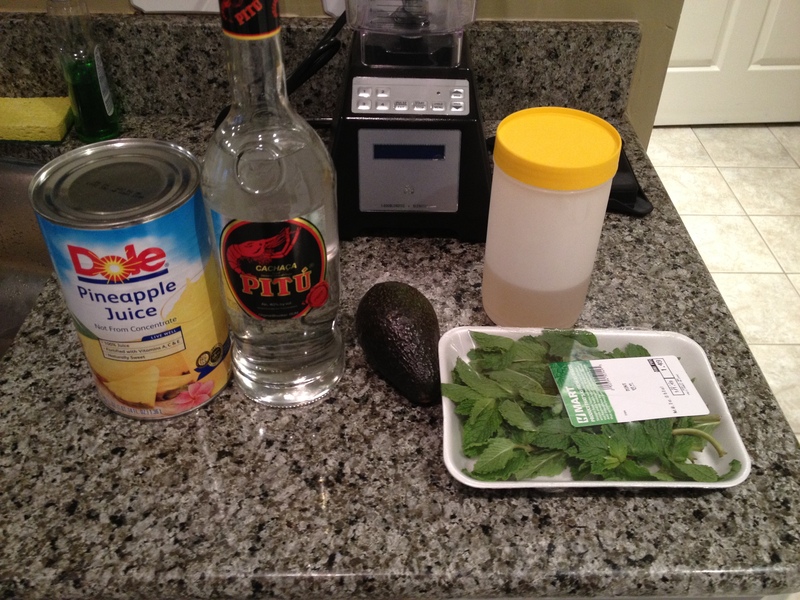 Muddle the mint and avocado together, then add the pisco, pineapple juice, and simple syrup. Shake with ice and strain into a glass. Garnish with a mint sprig. I changed up the recipe slightly by adding my homemade habanero-ginger syrup instead of plain simple syrup. Came out smooth and spicy. Goes great with Peruvian food. 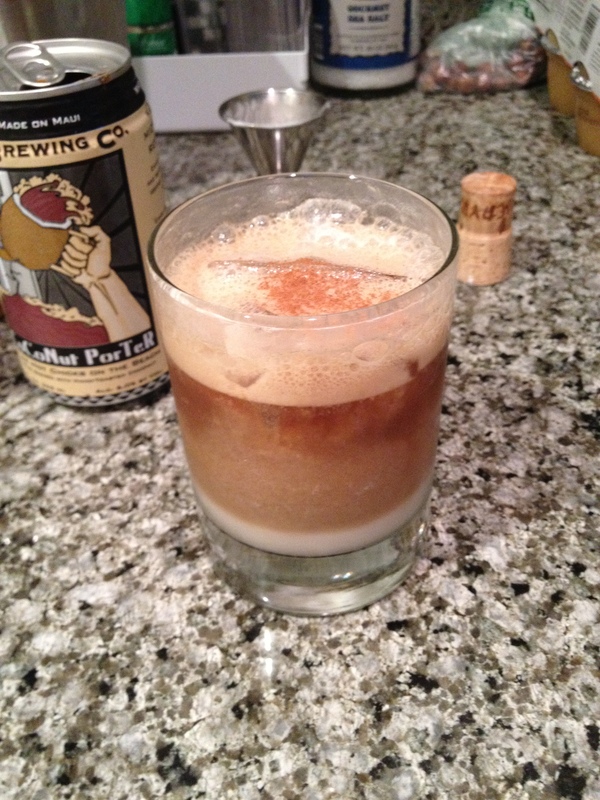 Next up is the Gunshop Fizz, created by some folks at Cure New Orleans, and posted at the Shake & Strain blog. I learned about this one while researching the recipe for the Trinidad Sour (my current favorite). Both drinks use bitters as a base (2 oz Peychaud’s and 1.5 oz Angostura, respectively), making them unique in the mixology world. Muddle everything but the Sanbittèr. 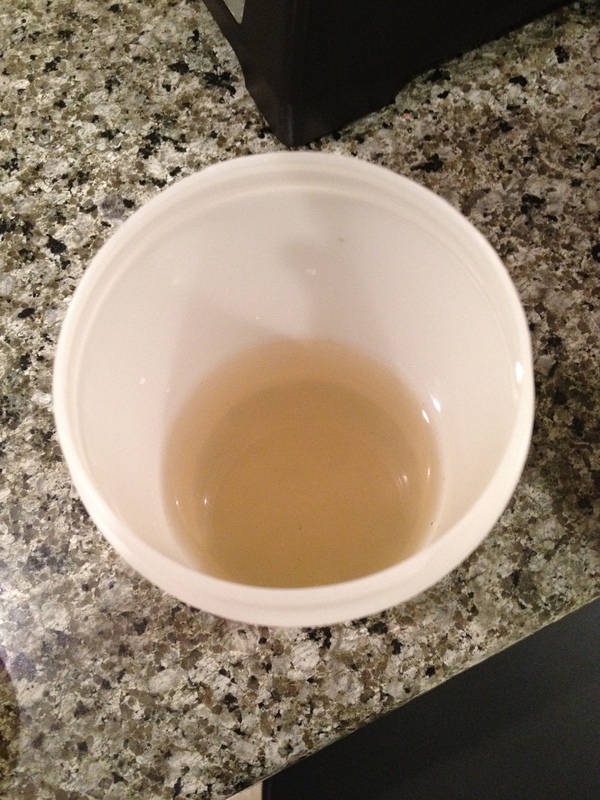 Set aside for two minutes, then add ice, shake, and strain (recommended to double strain through a cocktail strainer and a tea strainer – liquid should be thin). Top with Sanbittèr. Garnish with a slice of cucumber. For one of the versions I made, plain simple syrup got itself replaced by that of the habanero-ginger variety, and Sanbittèr apéritif got replaced with Campari and club soda (essentially the same thing, just with alcohol). I tried this four ways with another guinea pig tester. The first used the Campari and soda…very complex flavors between the bitterness of the Campari, the sweetness of the strawberries, the citrus of the orange and grapefruit rinds, and the freshness of the cucumber. The second just used club soda…this wasn’t bad either, and if you are not a bitter fan it might be the way to go. 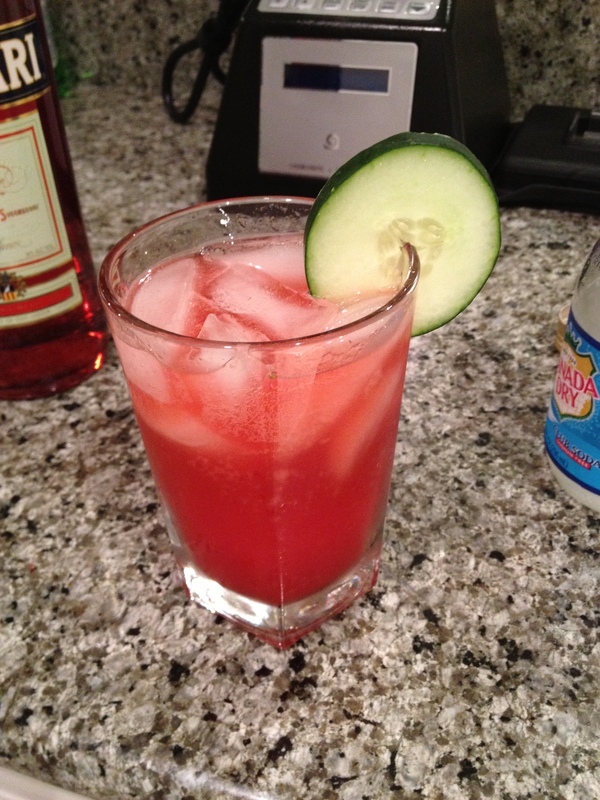 Third method replaced the Campari and soda with Schweppes tonic water with quinine…this was the favorite. The quinine bitterness is lighter than Campari and goes very well with the citrus notes of the drink. Fourth method was with nothing added after straining. This was a little sweeter than I’d prefer, but I can see some people liking it. I could also see this being good blended with ice, and that would lighten up the sweetness. A tasty and complex drink. You put in some work for this one, but it’s worth it. Donaji (Julian Cox of Rivera Los Angeles) – this cocktail includes chapulines, or grasshoppers. Those who have been to José Andrés’ Oyamel in DC may have encountered these buggers in taco form, and apparently they’re popular in some parts of South America. Besides including bugs (okay, the bugs are just on the rim mixed with the salt), it’s a fruity mezcal cocktail. Paddington (David Slape of PDT NYC) – a citrus rum cocktail with white rum, Lillet Blanc, grapefruit juice, lemon juice, orange marmalade, all shaken together and poured into an absinthe-coated class, garnished with a grapefruit twist. I made this one tonight, with the modification of Bacardi Gold for the recommended Banks 5 Island white rum (and sadly no grapefruit twist). Tasted great…I’ll attempt it again soon when I have the full recommended ingredient list. 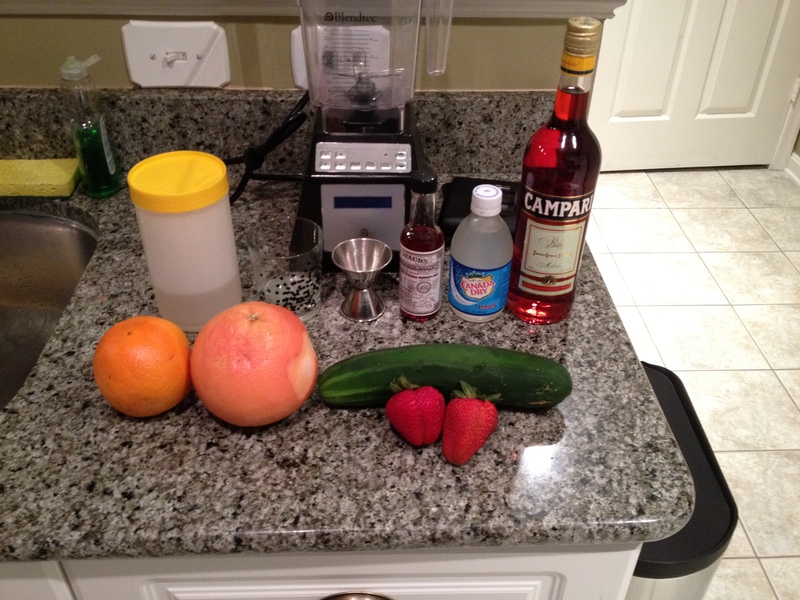 My version of the Paddington, sans some recommended ingredients. Turf (Thad Vogler of Bar Agricole San Francisco) – Gin cocktail with dry vermouth, Maraschino, absinthe, and orange bitters, garnished with a lemon peel. Sadly, while I wanted to pick up some Maraschino liqueur this afternoon, the Virginia ABC does not currently stock it (one of the very unfortunate parts of living in VA versus DC or MD is the lack of some types of alcohol due to the nature of state-run liquor stores). I’ll make this cocktail as soon as I can get my hands on a Maraschino bottle. Hush and Wonder (Toby Maloney of The Violet Hour Chicago) – Rum-based cocktail that includes Crème de Violette and grapefruit bitters (which are two more bottles on my list that VA ABC won’t stock – as far as bitters goes, it’s Peychaud’s or bust there), lime juice, and simple syrup. 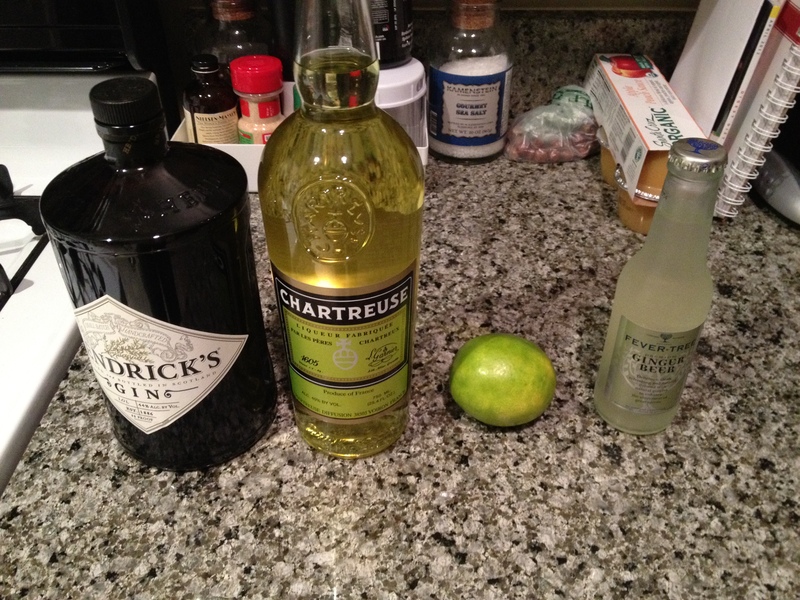 This cocktail is also on my production list once I have the requisite ingredients…it sounds fantastic. 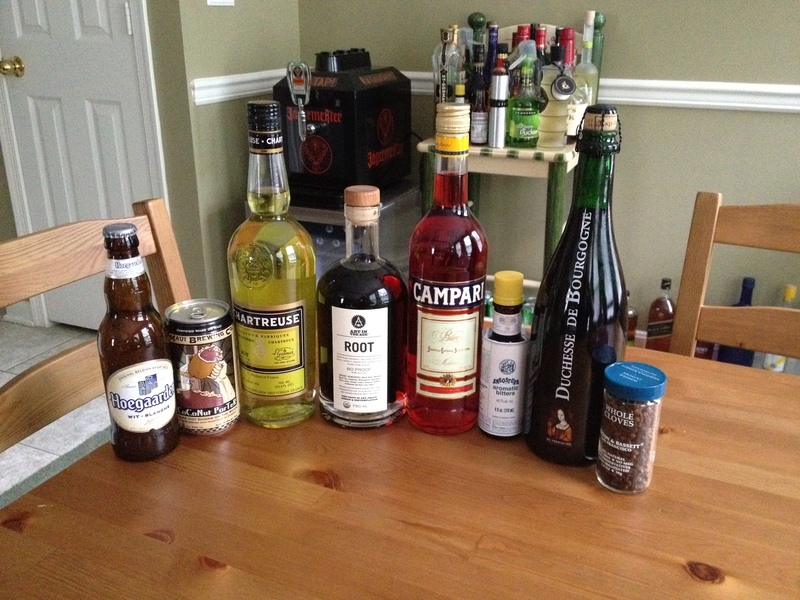 JBF is great…make sure to check them out if you’re a mixologist or gastronomist. There are some excellent recipes stored in their database. One habanero (I used a red one this time – it’s all I could find that was of good quality), and about 2-3 ounces of ginger, depending on how gingery you want the mixture to be. Color is a little darker (orange/tan) than the straight habanero syrup was. I used the same recipe as in the previous post on flavored simple syrups, but changed the flavoring inputs. I used one large red habanero and about three ounces of ginger. 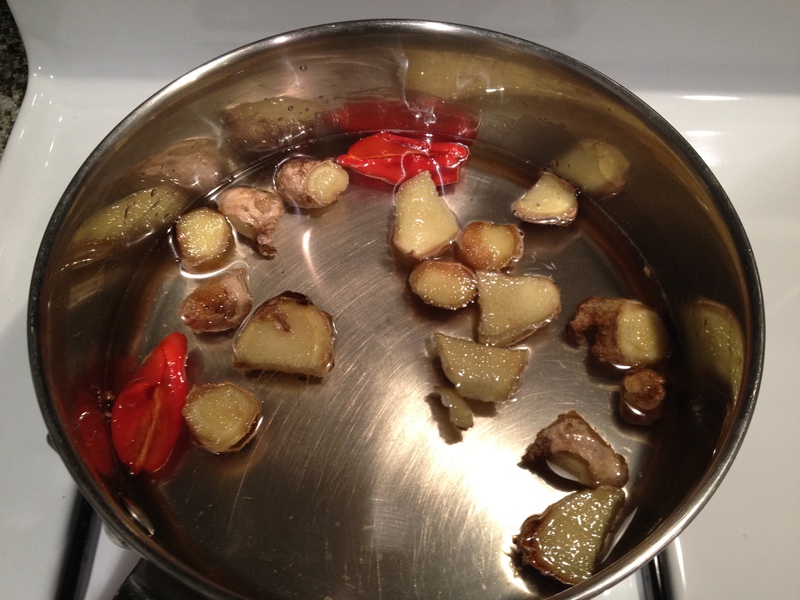 I peeled most of the ginger root and cut it into slices to maximize the surface area, then added both the peppers and the ginger once the sugar was fully absorbed into the water mixture, and brought it to a boil. I tasted a few drops of the final mixture. Great ginger taste with a nice burn. This is going to go great in some cocktails. I’m going to try reproducing a favorite of mine from SEI in DC called Liquid Wasabi. This one uses unfiltered sake, vodka, lime juice, and today’s syrup. It’s one of my go-to drinks at that establishment, besides the daily rotating cocktail (Evening Truth) and the Silver Samurai (shōchū, cucumber, plain simple syrup, crushed pink peppercorn). Here’s the latest additions to the mixology collection. Have some cocktails to make this weekend with these right here. Determined to finally jump on the bandwagon of the DC-area food truck craze, on Friday I set out for the city armed with my handy Food Truck Fiesta tracker. 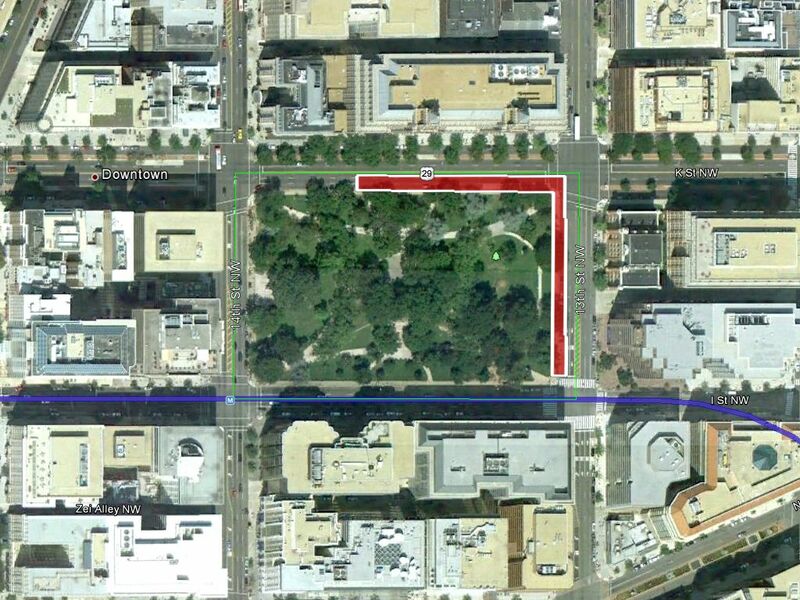 I arrived at the McPherson Square Metro Station and walked over to Franklin Park, conveniently just outside the station. This is an outpost where a number of food trucks set up shop (see area highlighted in red on map below). Food trucks set up in the area highlighted in red. …and these were the trucks on the north side of the park. For my first stop, I decided to go with Ball or Nothing. This truck specializes in meatballs of various types, and from what I can tell from their twitter feed (@theballtruck), they get pretty creative (I wouldn’t mind trying out the Tsukune – chicken meatballs in coconut rice that they were serving up on Wednesday). I’d just like to point out to the uninitiated that these food trucks are not the typical “roach coaches” that you might be familiar with. This scene has gone gourmet. 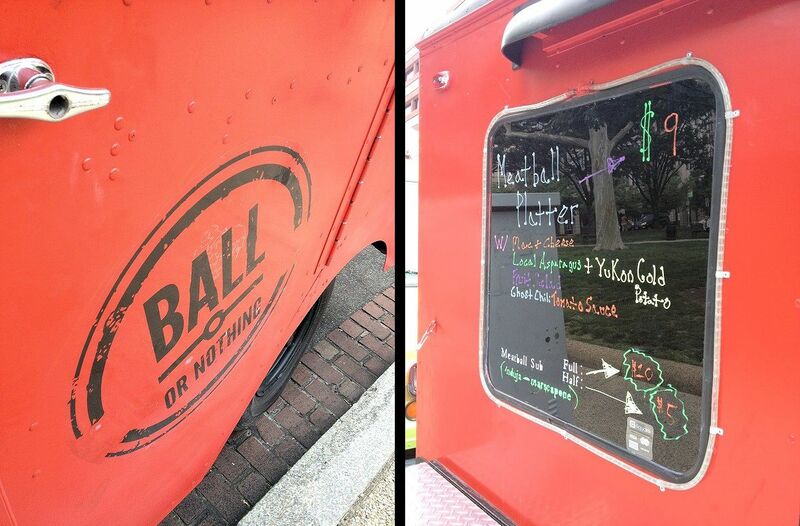 Trendy branding and tasty menu on the Ball or Nothing truck. I tried Ball or Nothing’s Meatball Platter ($9), which consisted of their meatballs on a bed of Mac & Cheese and Yukon Gold Potato, and topped with ghost chili tomato sauce, bitter greens, and local asparagus. There was a fruit salad on the side, with pineapple, pomegranate seeds, grapes, and strawberries. 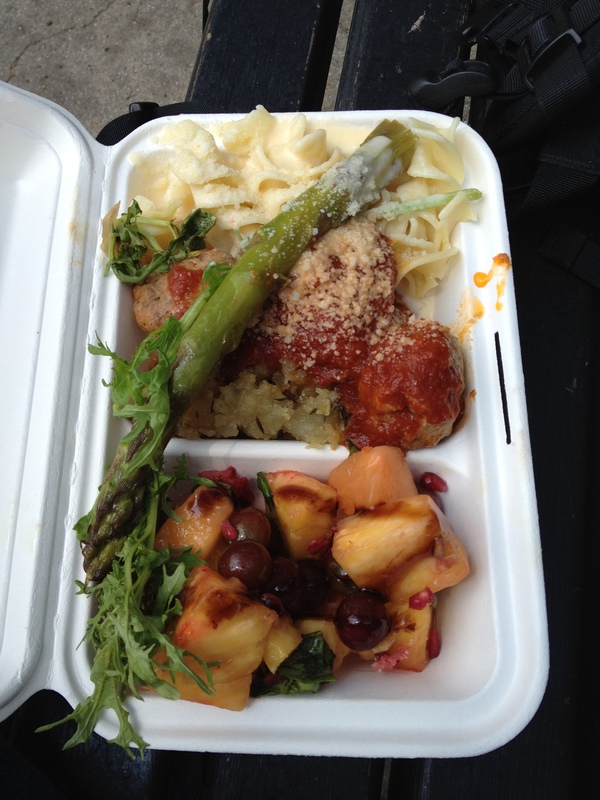 The tastes all worked together really well…I was definitely happy with my first food truck meal choice, and I’d hit them again. The Meatball Platter in all its glory. The Meatball Platter was definitely filling. Normally I wouldn’t need anything else, but since I was doing a food tour, and there are so many food trucks available, I decided to hit one more. Wanting to see more options (as if I needed to – seventeen in one place not enough? 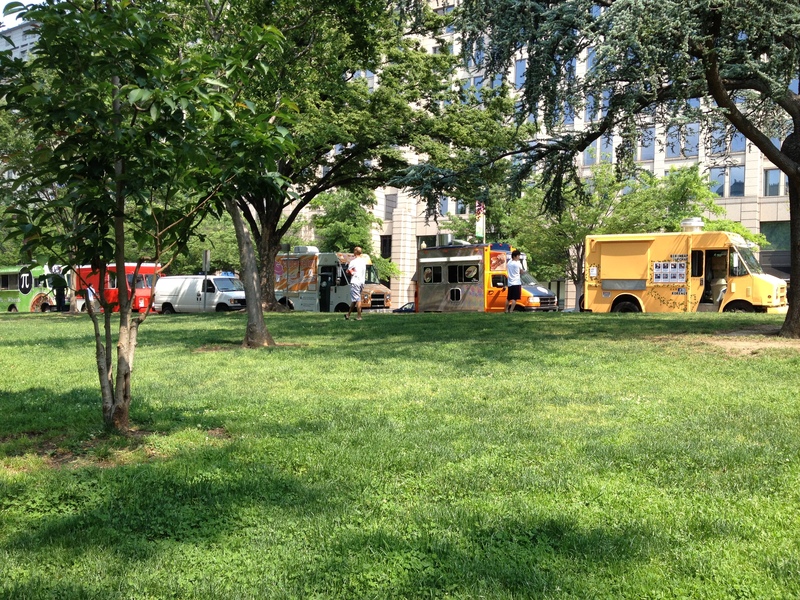 ), I walked over to Metro Center, which according to my handy food truck app was another hang out for the trucks (mostly along 12th St NW at the G St entrance to Metro Center Station). There is a courtyard next to the Metro Center escalators with plenty of seating for those that want to enjoy some time outside while eating their food truck lunches. 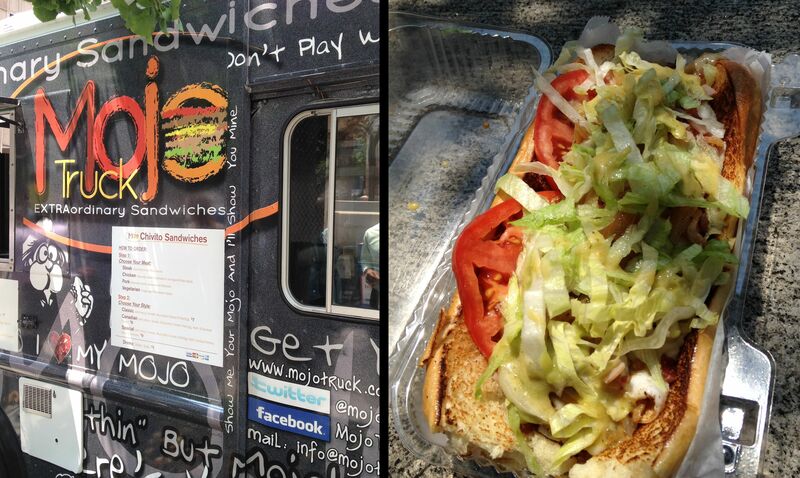 I decided to go with Mojo Truck (@mojotruck), which specializes in chivito sandwiches (a popular dish in Uruguay). When ordering from Mojo Truck, you pick a meat (steak, chicken, pork, or vegetarian), and choose the style of sandwich toppings (Classic [$7] – lettuce, tomato, mozzerella, fried egg; Canadian [$8] – same as Classic, but with ham and sauteed onions added; Special [$9] – Same as Canadian, but also includes bacon and avocado). I went with the Chicken Special Chivito this time around. Really tasty. The chicken in mojo sauce, the mozzerella cheese, the egg, and the avocado, and the nice and buttery grilled bread really did it for me. The sandwich isn’t small either…you’ll definitely be full from this. It took a little longer to get my food at Mojo Truck, but that’s because 1) it was noon by this point, 2) they seemed like a popular food truck and had a pretty large line, and 3) they grill your sandwich to order. The Mojo Truck with helpful ordering directions, and the Chivito sandwich before I dug into it. I have to say that I’m impressed with this food truck explosion, and based on the number of options available, clearly it’s got a decent market in the city. The mobile kitchen industry faces some issues though. 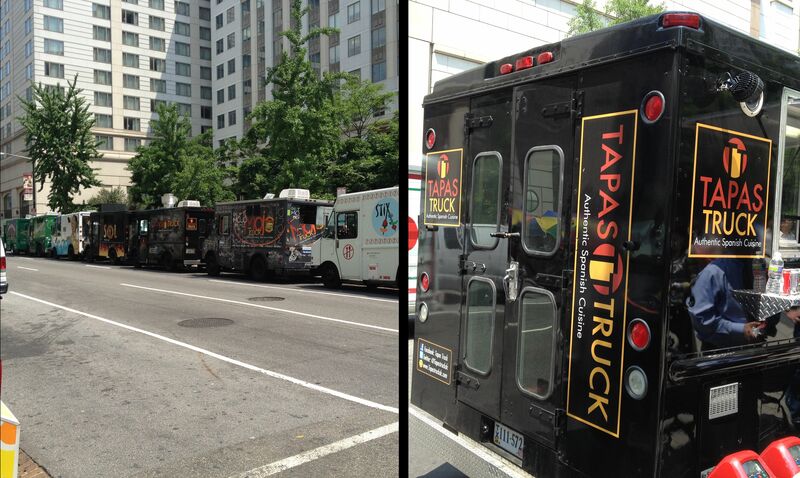 Apparently, DC police harass the food trucks, and the city has been too slow to change the applicable regulations to take into account this burgeoning market. Some of this might be attributed to pressure from brick-and-mortar establishments, however the smart and enterprising ones (Pi, sâuçá, among others) recognize that there are different eaters at different locations in the city, interested in different cuisine at any given particular meal. 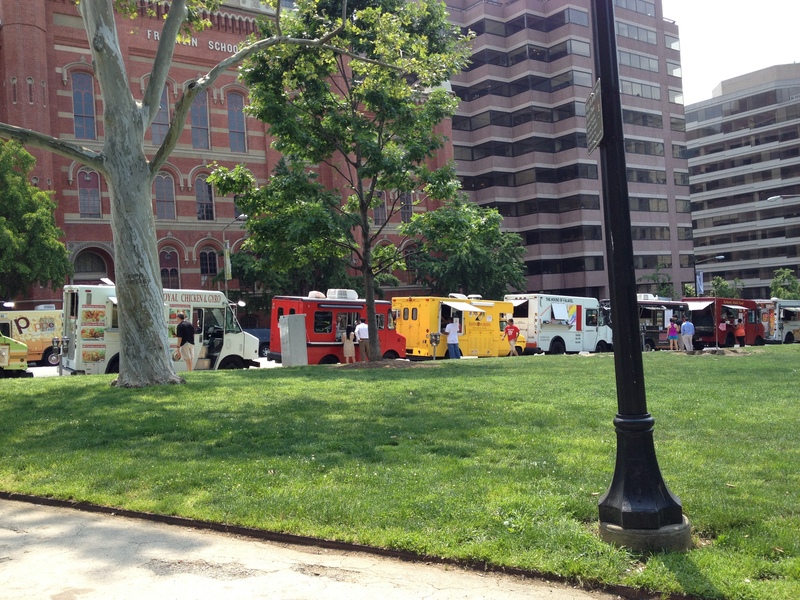 Some of these food trucks also act as incubator businesses that develop into restaurants, as has been seen in other parts of the country (see here, and here). Food carts are a cheap way for start-up chefs and gastronomists to test out their cuisine ideas and make cash to fund future hard-walled restaurants. 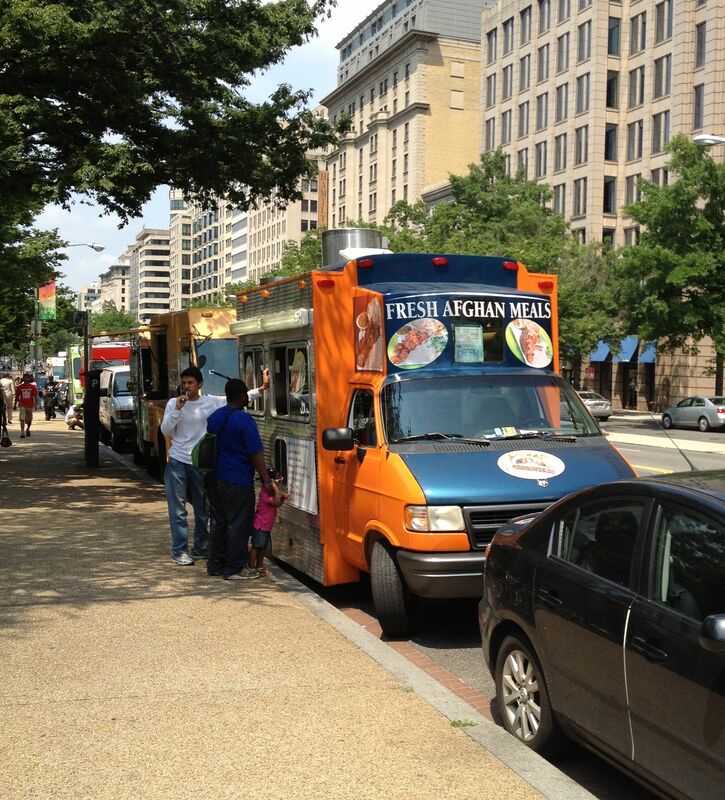 Overall, the food trucks are probably providing a boost to the economy rather than taking away from it, and DC bureaucrats should recognize this and get on board. Next, I really want to try TaKorean (Korean tacos? Yes please! ), a shawarma truck (saw quite a few), and an Afghan one (I saw one at McPherson that had some good stuff on their menu…Mmm mantu). DC is going to be seeing a lot more of me around lunchtime. Ben Eats is Moving to Austin!